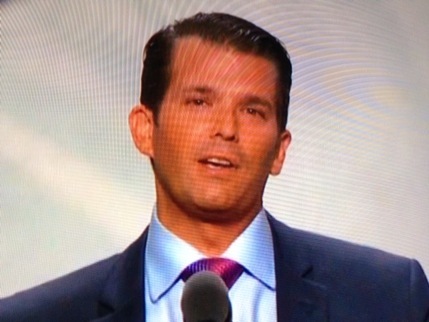 Donald Trump Jr. led off the 9 p.m. magic hour with a forceful and well-delivered speech on behalf of his dad. But after that, Night 2 of the Republican National Convention filled the rest of prime-time with a discombobulated Dr. Ben Carson and a former soap star. The D-FW ratings reacted accordingly, dipping significantly from Monday’s opening night. The night’s biggest single-network draw, NBC’s 7 to 9 p.m. edition of America’s Got Talent, had more total viewers (276,214) than the combined 9 to 10 p.m. convention coverage on ABC, CBS and NBC. AGT also led among advertiser-prized 18-to-49-year-olds with 85,744 while ABC’s coverage courted “hashmarks” (no measurable audience) before ending with a sub-teeny 952 viewers in this key demographic. No, that’s not a misprint. Here are the 9 to 10 p.m. convention numbers for both total viewers and 25-to-54-year-olds (main advertiser target audience for news programming). The combined total audience of 432,027 was down from 524,098 on opening night. And the number of 25-to-54-year-olds fell from 181,533 to 148,816. Over on Fox Sports Southwest, the struggling first-place Texas Rangers lost another late night road game to the Angels. It averaged 120,401 total viewers. NBC5 had a big day, sweeping the 5, 6 and 10 p.m. competitions in both total viewers and 25-to-54-year-olds. Fox4 again had twin wins at 6 a.m.